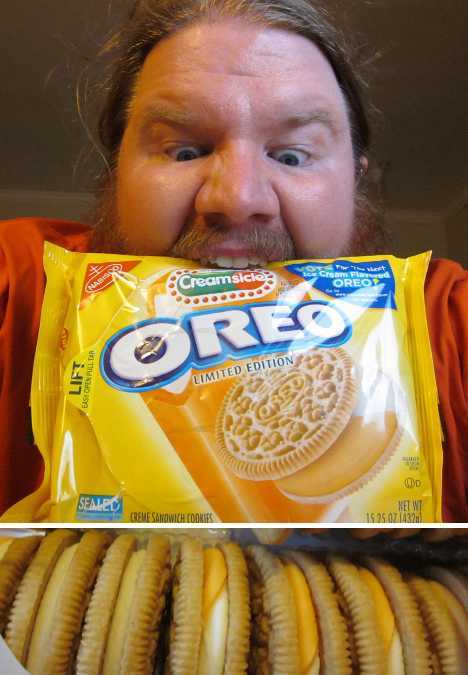 Oreo cookies have been tantalizing our taste buds for a hundred & a half years. Not only are the iconic bite-size crème sandwich the most popular cookies in the USA today, they’re enjoyed around the world in a variety of occasionally awesome, often odd permutations. Here are a dozen of the awesomest and oddest. Just as television only came in black & white, Oreo cookies also once sported those two opposing non-colors. 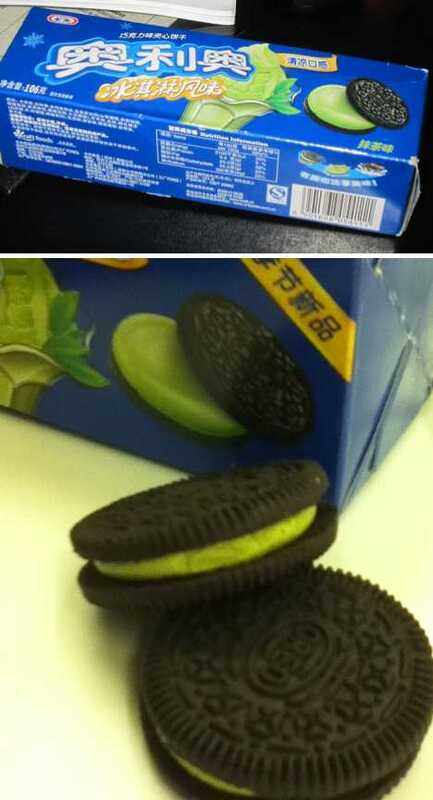 How times have changed, and Oreos have changed with them… though not necessarily for the better. 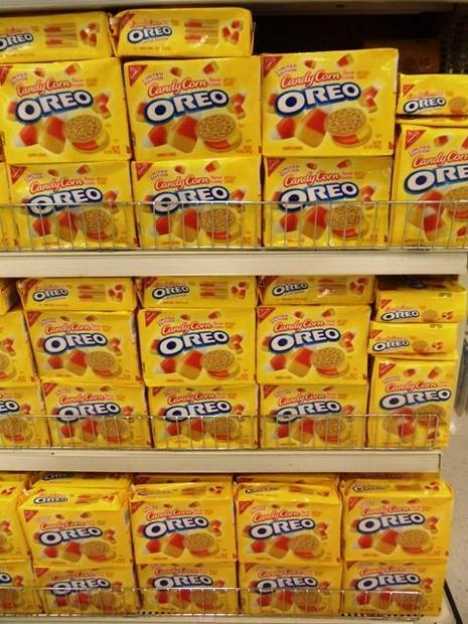 Case in point: Candy Corn Oreos, coming to a Target store near you on September 10th, 2012 as a salute, tribute and marketing opportunity centered on Halloween. 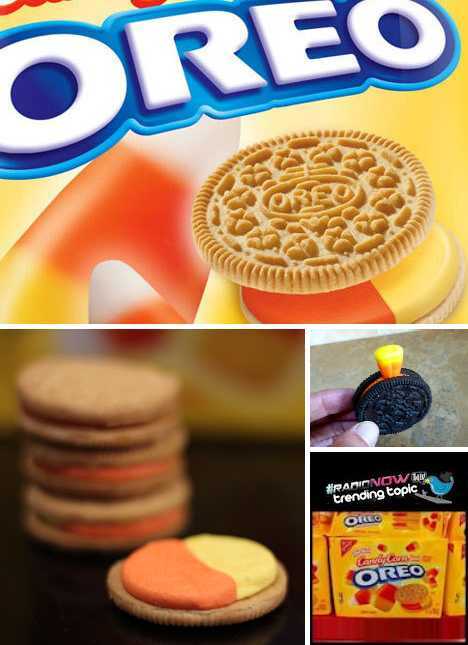 Candy Corn has its lovers and haters so we can expect Candy Corn Oreos to similarly polarize the nation, albeit for a limited time only. Of course, there are those who despise anything Candy Corn and are taking this new flavor as a sign of the end times. Lighten up, Francis, it’s not the worst thing that could happen… that would be Circus Peanut Oreos. 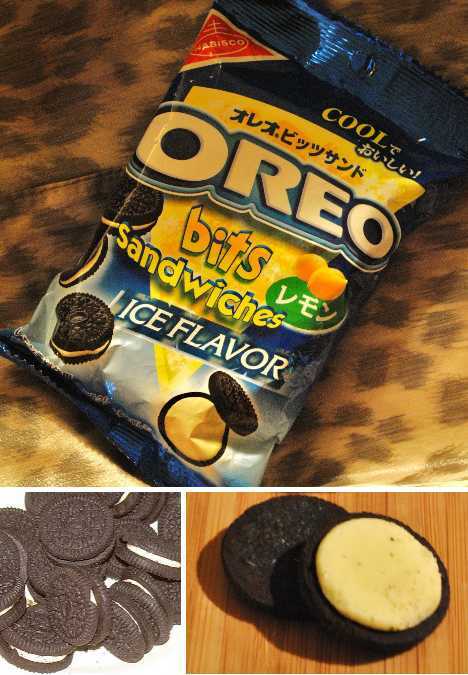 Snack shoppers in Japanese convenience stores coming across Lemon Ice Oreo Bits Sandwich cookies might recoil thinking they’re flavored with menthol but never fear, the “ice flavor” simply promises the cool, clean, citrus-y taste of a chilled lemon meringue pie. Moreover, the cookies may be bite-sized but they’re not “bits”, unless you’ve accidentally sat on the package while riding the subway. 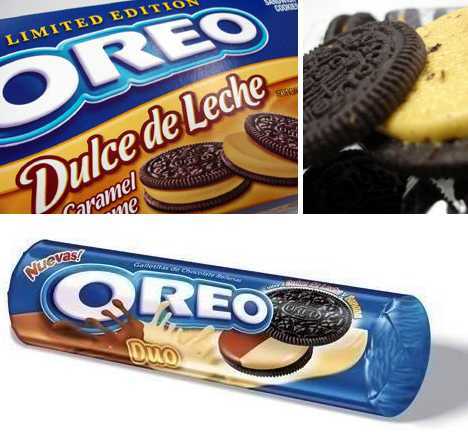 Don’t cry for me, Argentina, ’cause you’ve got Dulce de Leche Oreo cookies and we’re stuck with Candy Corn Oreos. What’s this “Dulce de Leche” of which we speak? In a nutshell, Dulce de Leche (roughly translated from Spanish as “candy of milk”) is a delicious South American treat made by simmering milk with sugar until the former partially caramelizes… and no nutshells are required. 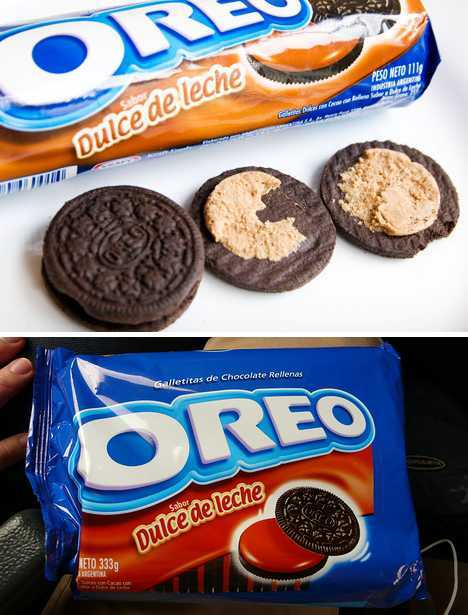 Dulce de Leche Oreo cookies have appeared in the USA as a Limited Edition release from time to time but you have to stowaway aboard a tramp steamer to Buenos Aires to get ’em 24/7/365. Just to rub it in, the people of the pampas also enjoy Oreo DUO Dulce de Leche & Banana any darn time they want. 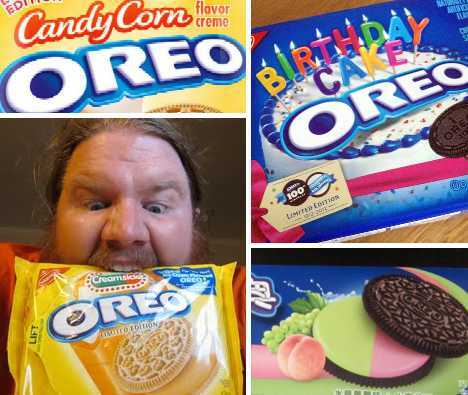 Oreo cookies landed on Chinese store shelves in 1996 and 10 years later, Oreo rules the roost as the best-selling cookie in the People’s Republic of China. Oreo’s rapid rise was no slam dunk though it took former Houston Rockets superstar Yao Ming’s talents to sell Chinese consumers on Oreo’s glory… that, and a reduction in sugar content. 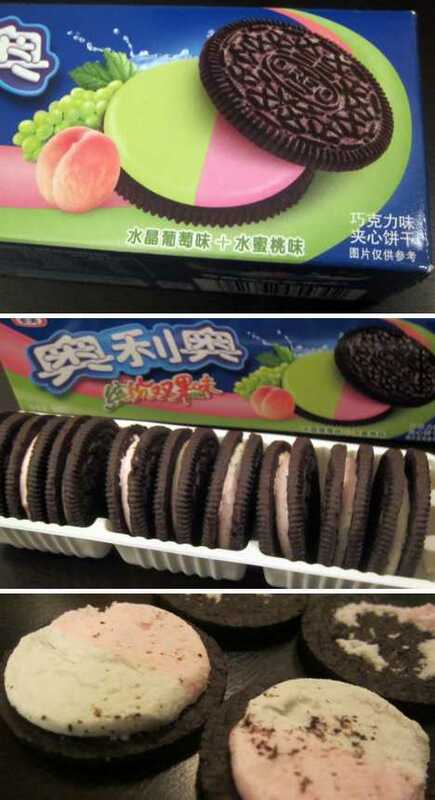 Having reached the top of the Chinese cookie mountain, Oreo’s are now spreading out with some enticing alternative flavors, such as Double-Fruit Peach & Grape. 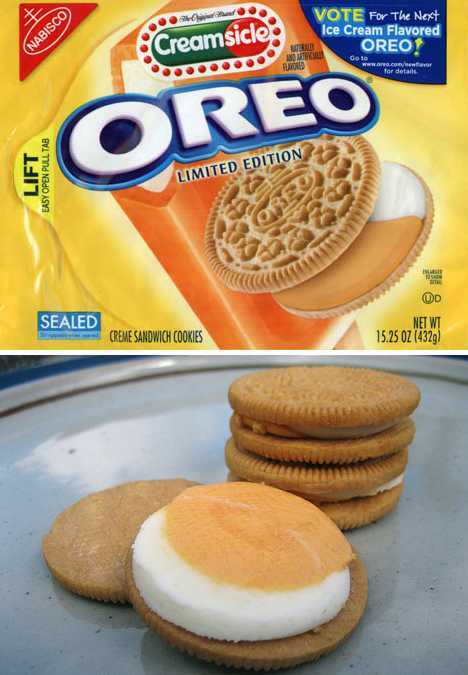 “You got your Creamsicle on my Oreo!” “You got your Oreo in my Creamsicle!” Two great tastes that taste great together? Nabisco thinks so, at least they do for a limited time. Creamsicle Oreo cookies are one of a number of ice cream flavored Oreos introduced in recent years but they stand out by virtue of referencing an actual name brand ice cream bar as opposed to garden-variety box ice cream. Limited Edition Creamsicle Oreo cookies, product cross-pollination aside, don’t have much in common taste-wise with actual Creamsicles but you could always pop a box in the freezer just for the heck of it. Ice cream and Oreos aren’t just an American obsession, just ask our cookie-lovin’ counterparts on the other side of the world. Green Tea Ice Cream Oreo cookies may not have a familiar childhood-resonating vibe but in China everyone of every age screams for ice cream… green tea variety. Count on Kraft China to lighten up on the sugar content while upping the adult-friendly flavor of green tea.